Snoopy – Available for Adoption! 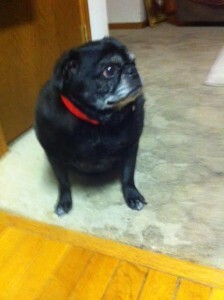 Dislikes: Doesn’t necessarily like to be left on his own if his people are home. Snoopy is a sweet and agreeable little boy looking for a quiet and loving home. 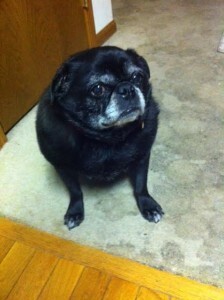 He gets along great with the senior pugs at his foster home, and although we haven’t seen him around other dogs, cats or kids, we suspect he would do just fine. He’s a vocal communicator, and will let you know if he wants to go outside, come back in, or join you on the couch. Except for needing to lose some weight, he seems to be in excellent health. He’s never had an accident since he came here on New Year’s Eve, and goes in his crate without a struggle. We haven’t seen how he does in a higher-energy environment, but he seems very comfortable in his current quiet setting. He very much wants to be around his people when they are home, and needs their love and affection. Will you be his people? Interested in adopting Snoopy? 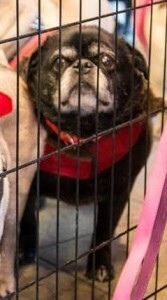 Please see our website and fill out an application at: www.pugpartners.com/adoption-application Snoopy’s minimum adoption donation is $250.